If you haven't experienced maple sugaring first hand, we have great news! If you stay with us in the spring, generally throughout March and sometimes into early April, you can join us for maple sugaring in our very own private sugarhouse. 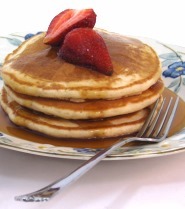 We're the only Vermont bed and breakfast that we know of with their own sugarhouse. Our sugarhouse is locate a few hundred yards from the bed and breakfast and each year we tap the 100-year old maple trees around our property, gather the sap, and boil 40 to 50 gallons of maple syrup, which is in turn sold to our guest throughout the year. 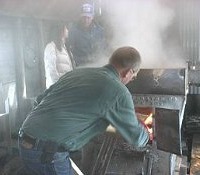 If you join us, you'll be able to help gather sap, stoke the fire in the sugarhouse evaporator, and watch as Farmer Bill boils delicious maple syrup. You can participate as much as you like, gathering sap or simply watching, learning, and best of all, enjoying in the sugaring conversations. (Farmer Bill loves to tell stories). We also like to enjoy a little wine and cheese with our guests, or hot cocoa if the weather happens to be cold. Our 80-year old sugarhouse is rustic, but we wouldn't have it any other way. Sugarhouses throughout Vermont come in all shapes and sizes. Some are very old, and some are new, but we think sugarhouses are best when they have that old-fashioned backwoods charm. 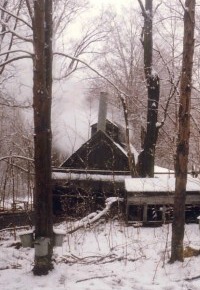 You gotta hike through the woods and snow to get to our sugarhouse, but that's part of the fun. 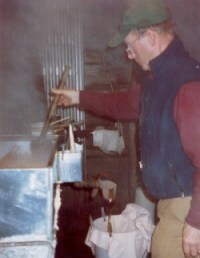 No phones, radios or TVs, just good ol' conversation and the work at hand - boiling maple sap into delicious maple syrup. Sometimes we joke that the experience is like Gilligan's Island, with snow! We also still gather sap the old-fashioned way, with buckets. Some Vermont sugarers now use elaborate plastic tubing systems that bring the sap from the sugargrove trees directly to the sugarhouse storage tanks. 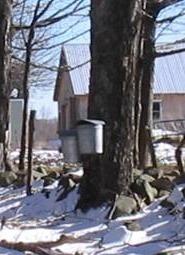 Since we are a small sugaring operation, using the old sap buckets works fine for us. Though we have to admit, we sleep well at night after gathering sap and boiling syrup all day. Without question, when you get home you'll have had a unique Vermont vacation that you'll want to tell your friends about. We encourage guests to make reservations early, and though the days are getting warmer this time of year, it is still chilly with snow on the ground, so bring your foul weather gear. We'll supply the hot coffee, cocoa and snacks. 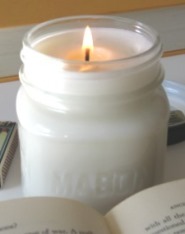 For more information about our maple sugaring operation, Click Here. If you visit us in the spring and help us make maple syrup, then you can sample real maple syrup as it's being boiled, hot from the boiler. 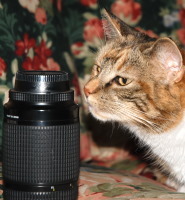 And be sure to also take some maple syrup home with you. YUM! Sap buckets along the road at Shearer Hill Farm B&B.